Aquascape Maintain for Ponds combines our most effective pond water treatments into one powerful formulation to successfully keep ponds clean, clear, healthy, and maintenance-free. This easy-to-use water treatment contains a powerful blend of beneficial bacteria, phosphate binder, flocculent, and pond detoxifier. The bacteria blend includes lithotrophic, heterotrophic and photosynthetic bacteria strains, keeping pond water healthy, beautiful, and safe for pond fish. The included phosphate binder locks up excess nutrients that could otherwise cause issues with water quality, and the flocculent quickly clears cloudy water by clumping suspended debris. A pond water detoxifier is added to the formulation to remove and detoxify chlorine, chloramine, heavy-metals, and other toxins, making your pond water safe for fish and plants. 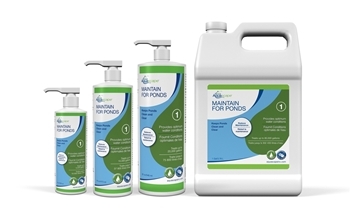 Maintain for Ponds is safe for fish, plants, pets, and wildlife. Aquascape is passionate about the products we produce, providing unique products, designs and features that stand above the competition.